Simon Chan, professor of systematic theology at Trinity College in Singapore, challenges the way in which Asian theology has been understood and reified by Western theologians. Chan poses the question of why Asian theology largely consists of elitist theological accounts that fail to take grassroots Christianity seriously. For Chan, practicing Asian theology at the grassroots level is to reject standardization in the development of any theological locus. In other words, Chan’s approach is based on neither Western nor Eastern patterns of thought, as both are incapable of reflecting the questions and needs that arise from the daily lives of ordinary people. 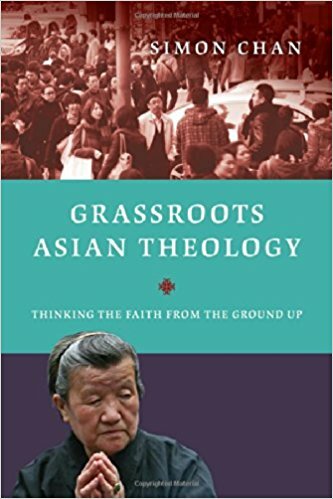 Instead, Chan approaches the issue with a more pertinent question: “what spiritual and intellectual resources of the Christian faith can we bring to bear on the Asian context such that an authentic Christian faith can be effectively communicated and received?” (10) His book Grassroots Asian Theology offers the response that the grassroots should dictate the shape and direction of Asian theology. Grounded upon his belief that theology is the lived experience of the church before it is a set of ideas formulated by theologians, Chan shows deep concern with what is considered the foundation of grassroots Asian theology. Arguing that the experiences of elitist sociopolitical individuals do not accurately reflect the accounts of ordinary Asian Christians and the experiences of faith communities, Chan argues that grassroots Asian theology should be bounded by “ecclesial endeavor requiring cooperation between the people of God and the theologian.” (17) Taking ecclesial experience as the primary source, Chan presents its importance: 1) it avoids understanding theology as merely objective facts or subjective experience; and 2) it enables grassroots theology to be ratified in the church by ordinary Asian Christians and faith communities. While Chan accepts ecclesial experience as the living tradition for practicing Asian theology in a different way, he does not reject the universal Christian tradition which he argues is a sketch of elitist theologies and theological explorations of traditional positions such as God in Asian contexts (Ch. 2), humanity and sin (Ch. 3), Christ and salvation (Ch. 4), the Holy Spirit and spirituality (Ch. 5), and the church (Ch. 6). Since ecclesial experience which reflects both the questions and needs that arise from everyday life is addressed in a biblical manner, Chan suggests that making use of ecclesial experience for practicing grassroots Asian theology not only offers western academic circles the opportunity to expand their scope of understanding, but more importantly, allows theology to be further qualified by and under the power of the Spirit. The essential task that Chan carries out is to show how several cultural particularities affect the understanding of major loci of the Christian faith. For example, the theme of honor and shame are used to better articulate the doctrine of sin and salvation in the Asian context. This theme is of particular importance because considerations of honor and shame culture have been overshadowed in Western Christianity by its dominant forensic emphasis on objective guilt and righteousness. Given that values are communal in the Asian tradition, sin, as “the loss of honor” (85), means that we are collectively embedded as “members of a race who together stand ashamed before God because we have corporately robbed God of his honor.” (87) Accordingly, salvation and righteousness, as “the restoration of honor,” (85) is more than just a personal acquittal before God; it also represents that we are justified in Christ corporately as all die “in Adam” all shall be made alive “in Christ” (1 Cor 15:22). Chan’s manifestation of a honor/shame-based understanding of sin and righteousness shows that the Christian lifestyle in Asia is truly about the community, the relationships, and how they must be prioritized. I certainly believe that Chan’s attempts to understand traditional theological loci on the Asian cultural tradition helps Asian theology reach beyond the limited theological framework that is either colonized by blind admirers of Western theology, or parochialized by unilateral advocators for Asian particularities. As Postcolonial feminist theologian Kwok Pui-lan argues, Chan’s reconstruction for grassroots Asian theology rejects blind emulations of Western theology, which have ultimately attenuated the unique aspects of the cultural particularities that Asian theology offers. Moreover, Chan’s grassroots Asian theology does not follow what Dalit, Minjung, and other forms of Asian theology that fail to stand in a continuity of a larger Christian tradition. In some ways, I question why Chan attempts to categorize the core theological loci of Asian theology in a manner similar to Western theology instead of applying a new frame to what is a novel perspective on Christianity. Nevertheless, I highly value this book’s contributions in accurately characterizing Asian theology at the grassroots level in order to refuse the representation of ordinary Asian Christians as victims of Western colonization, or as objects of elite-centered Asian theologies, and to instead to see them as active agents of Asian theology renewed by the Spirit.